Polar bear populations are likely to fall by more than 30 percent by around mid-century as global warming thaws Arctic sea ice, according to experts who have conducted the most detailed review of the predators to date. The report, by the IUCN (International Union for Conservation of Nature), estimated there are between 22,000 and 31,000 polar bears in the Arctic and said they will be increasingly vulnerable as their habitat shrinks. 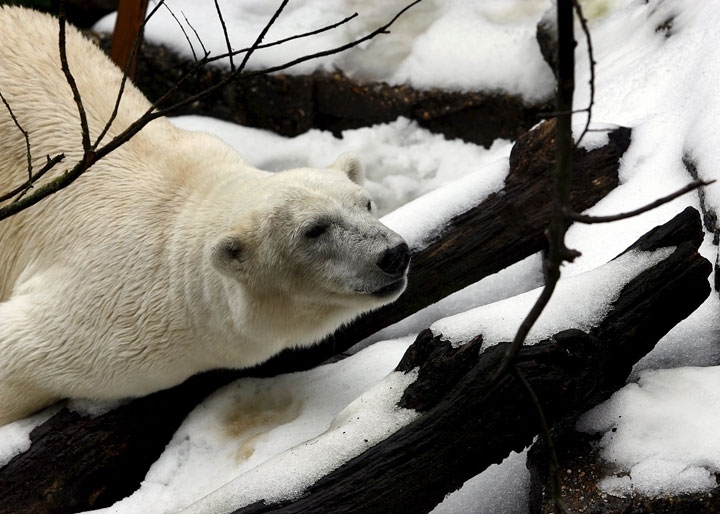 Tania, a 16 year-old polar bear, rests on a snow-capped rock at the Artis zoo in Amsterdam in this Aug. 3, 2006 file photo. “Climate change will continue to seriously threaten polar bear survival in the future,” Inger Andersen, IUCN Director General, said of the study, based on updated counts and new projections of sea ice since a previous review in 2008. It said there was a high probability that “the global polar bear population will decline by more than 30 percent over the next 35 to 40 years”, broadly reaffirming findings from 2008. Andersen urged almost 200 nations, meeting at a U.N. summit on climate change in Paris from Nov. 30-Dec. 11, to restrict greenhouse gas emissions to slow the melt. The IUCN groups scientists, governments and other experts. Polar bear numbers have risen in some regions in recent years because of better protection and bans on hunting, but estimates of overall populations from past decades are vague. The shrinkage in sea ice, which in September 2012 was the most severe since satellite records began, will make it ever harder for polar bears to catch seals that live on the ice, the report said. The IUCN said a Red List of animals and plants that it compiles found that 23,250 species were endangered of 79,837 assessed so far. Polar bears are listed as “vulnerable,” the least endangered category on a scale that ends with “extinct”.